For the most part, people are creatures of habit. I have to admit that I am in that same boat. With that, change is hard on folks and our recent changes have shown to be no exception. I have taken a lot of heat for recent decisions to make the farm stronger and put us in a better place for the new year to come. All I can hope is that you realize that we make changes with the best interest of the farm in mind. At the end of the day, this farm is my dream and my baby, I am not going to endanger it on willy nilly decisions. The new pricing structure had to happen. But while picking buckshot out of my tushie, I gained a real sense of clarity on an important point that I do not want to lose sight of right now– we have had an amazing year. So on this week of Thanksgiving, I want to offer you a snapshot of what this year has looked like for our farm. And why I am extremely thankful this week. Chickens. Last year in November we made the investment to once again bring you the healthiest eggs that we could. We ordered 700 baby chickens and raised them throughout the chilly months under TLC and heaters so that we would start egg production in the spring. I have to say that it has been wonderful to have the chicks back on the farm and to remove any regional eggs from our distribution. Milk. 2014 will be the year that we removed all regional milk from our distribution as well. Scott Rasband and Mike De Smet now meet all of our members’ milk needs. Beef. We have closed the borders on all beef outside of New Mexico. This has been a huge challenge for us in the past, but this year we overcame all of the obstacles. Pork. 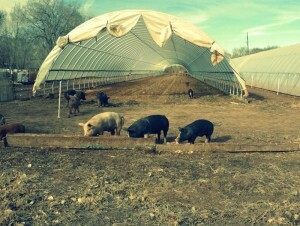 We continue to expand our pasture-raised pork on the farm. What started out as a 4 pig trial in the North Valley has grown into over 120 pigs a year on the farm. All the piglets are born at a ranch in Ojo Caliente (not the spa!) and then we bring them down to the farm when they are 6 weeks old. On the farm they eat weeds from our fields and any compost that we give them. They never spend one day indoor and have acres to roam and do whatever pigs do. Which is sleep and root around the dirt if anyone asks you that question at a dinner party. So to meet this increased demand, we will bring more pigs to the farm this season. The pigs have become one of my favorite parts of the farm. Prepared foods. Earlier this year we had some members asking for some healthy and easy prepared food options. We threw a toe in the water to see what the reception would be. Wow. The demand was and continues to be huge. I get it too. I use these new products a bunch. In between indoor soccer games and homework, a dude and his family have got to eat. And these new meals have given our members (and me) super high quality convenient foods less expensive than fast food prices. Finally, I save the best and the dearest to my heart for last… our produce. There have been several times throughout the course of the farm that I find myself a firm believer that things happen for a reason. As a matter of fact, my fortune cookie from last night reminded me that “Failure is opportunity in disguise.” And that is where we found ourselves for the first time this fall. We lost all of our fall crops to grasshoppers. First major failure in 11 years. We could have cursed the grasshoppers and chalk it up to bad luck. Or we could grow from it. 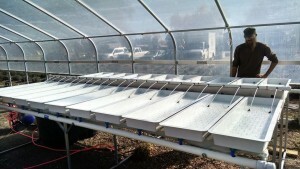 Right now we have baby seedlings carefully protected from bugs and frost inside our hydroponic tables in a heated greenhouse. Seeing baby seedlings in November is the epitome of opportunity in disguise. Our failure has strengthened our farm. And for this, I am very thankful. All in all, we have faced many challenges this season. And without exception we have overcome them and are stronger because of these hurdles. I can honestly say that we have never been in a more solid and sustainable spot than we are right now. So enjoy your thankful feast this week knowing that your support is an amazing part of this local food movement. Positive change is happening because of you. First up this week, let’s look at a little scheduling for the Thanksgiving holiday coming up. Since no one really wants to get a Harvest Box full of yams and cranberries after Thanksgiving, we consolidate all of our deliveries into Monday, Tuesday and Wednesday the week of Thanksgiving. This also allows our hard working team to enjoy a few days off with their family and amigos. So please make the following notes for Thanksgiving week. Monday Deliveries/Pick-Ups: No change for all greater ABQ, Santa Fe, Los Alamos and Las Cruces orders. Tuesday Deliveries/Pick-Ups: All orders as usual. Please note this will be the ONLY daytime East of the river deliveries for ABQ. Wednesday Deliveries: No change, but please note this will be the ONLY day for Westside daytime delivery. Thursday Deliveries: ABQ Night Deliveries will be made on Tuesday Night. Whole Foods pick-up will be Monday. Friday Deliveries: All ABQ deliveries will move to Tuesday. All Santa Fe deliveries will be made on Monday. Saturday Deliveries: Please move your orders to Tuesday/Wednesday deliveries. Please make note of all these days. We will have a wonderful week of traditional Thanksgiving foods and would love to help keep you out of the craziness at the grocery stores. We will have the menu posted earlier than usual to help you make arrangements for your planning. Now onto another reminder about the change in our free delivery structure that will begin on Monday 11/17. All orders, both pick-up and delivery, will remain free for order at/above $35. For all orders less than $35, there will be a $4 delivery charge. This will be across the board for all pick-up and delivery members. I cannot stress this enough, but this is not a move to nickel and dime our members. This is a move to remain viable financially for years to come. We lose money on smaller orders and cannot afford to continue that system. I had a member write to me that they cannot take the increase and they have to quit being a member. I hate seeing anyone leave, but I would rather a handful of members leave than for me to write a newsletter saying that we have to quit being a farm. I am a firm believer that we have to protect the herd above and beyond all else. Which means that we might have to make decisions that hurt some individuals. Again, I do not like seeing that, but our herd will continue to prosper. I also would like to encourage any of you to head into the dreaded grocery store if you feel that our prices, service and quality are not a good value. We do not raise our prices to give you “free” delivery. We are able to offer our free delivery through efficiencies of our business model and through your support of buying more items for your kitchen and home. We have been fine-tuning this for 11 years and we have come to a really positive spot I think. And this is by no accident. We are very deliberate with what we do and the changes we make. Lastly, I would like to point out that through your financial support of the farm, you not only are supporting our food, but our business model as well. I feel that we have built a farm and a business that our members should be proud to be a part of. (Don’t end sentences with a preposition kids.) All of our employees get a free medium Harvest Box a week. We have health and dental coverage. And our pay scale ratio from top to bottom is 3:1, meaning that no one makes more than 3 times our lowest salary. Compare that to CVS at 422:1. My point is that we are not trying to just do well in the fields, but we want to be a business that you feel good about supporting. And we want to be around for the long haul. Thanks for all you do for the farm. Before last week I never knew raw milk was a flammable liquid. But I guess it is. My email got hammered after we announced that we had been approved to bring you raw milk from the De Smet Dairy. So please allow me a few moments here to further discuss this new addition. By carrying raw milk, I am NOT telling everyone that they need to drink it. I am not saying that it will cure all the gutter balls you throw at the bowling alley. Our offering the milk to you is based on two straightforward things. First is the demand. We sold over 160 half gallon jugs of raw milk this week. You cannot see numbers like that and say there is no demand for raw milk. Our members have been asking (begging) me to bring the raw milk for years, so we are happy to be able to make this happen. 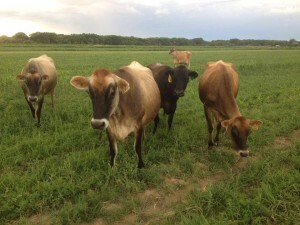 Second is that helping local farmers and ranchers grow is an integral part of the our mission. I want boots in the fields across this enchanted state. So if we can help keep boots in the dirt, we are going to do it. And for the De Smet family, that means bringing their milk to the 675,000 mouths who cannot go into a store and buy it. So I stand behind supporting family farms 100%. Lastly about the milk is we are not forcing anyone to drink it. This is a choice, an option. We have posted the CDC’s warning on Raw Milk on our product page. I want to educate our members, offer options, and then let you all make the decision you feel is best for your lives. Freewill is an important and necessary responsibility we have. Next up this week is a little look behind the curtain. So jump into the board room with me for a second as we look at our “Off-Season” state of the union or CSA. As a business, I do not like to change big things up more than once a year. With that said, we do a pretty thorough self-examination at least once a year to see where we are and how previous decisions are affecting the farm. Last year we did something that we have never done before in our 10 years, we lowered our prices. We have built so many amazing relationships with growers and suppliers around the region that we had finally reached a point that we could (and did) pass the savings along to you. That has been all very good news and a sustainable move. On the delivery side of things, we have been tracking every minute and every gallon of gas that it takes to deliver an order to a member’s door. The verdict….drum roll please.. $4 an order. That covers vehicle, fuel, insurance, labor, and the occasional breakfast burrito for our drivers. At first glance, I was like dang that is pretty efficient for a mom n pop shop like the farm. I bet a lot of big delivery companies cannot boast that kind of cost per delivery. But on closer examination it hit me that $4 is too expensive when we have such a small minimum order of $30. And I don’t think anyone can argue with that. So I hit the internet to see how other folks in the delivery industry juggle delivery fees and minimum orders. I saw $40, $75, $50, and then I went to Amazon. $35 for free delivery. I was forced to concede. If Amazon cannot deliver for free for less than $35, then we sure cannot do it for the long run either. So, here is my thought. We could raise the price of the items to help cover these costs. We could give you less food for your money. But honestly that does not feel right to me. The issue we are faced with is simple, we can make the current price level work if the order is big enough. That way the delivery cost is a smaller percentage of the total order. Makes sense. So instead of playing pricing games, I will be very honest. The free home delivery model does NOT work at $30. I am confident that it will work for us (and you) at $35. Therefore, any orders beginning 11/17 that are less than $35 will pay a $4 delivery charge. Any and all orders of $35 or more stay at the free delivery. I feel confident that this is the most fair and equitable solution for all of our members.